Libratone - Ants in Your Pants Social Ad from Farinella on Vimeo. Libratone had a problem. A Facebook business problem, to be exact. Not Likes or Fans. Business. Libratone launched in the United States using a direct sales philosophy, tapping Google to drive traffic and Amazon as an additional sales channel. The company’s digital marketing team had experimented with Facebook, but (as they said) hadn’t cracked the code.We met them in the middle of 2017, excited to see if we would make good partners. 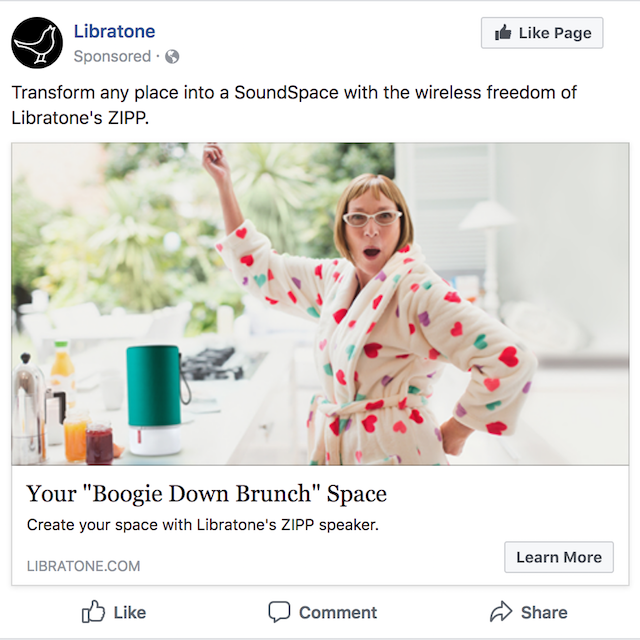 Libratone had a precise request: don’t be a creative agency looking to churn out ad after ad, be a smart agency with a plan. The strategy combined information gleaned from the company’s past brand work, an updated brand definition, and a deep dive into the wireless speaker industry. We pared down interests and audiences to build precise personas. Then we dove into the creative work. Along the way, Libratone’s updated brand definition and promise of “Creating a SoundSpace Around You, On You, With You” informed our work. As with any digital marketing project, all of our strategy and creative assumptions were challenged early on. To ensure we were reaching the right audience with the right message at the right CPA, we continually refined and reworked our offerings. We continue to work and evolve and evolve and evolve Libratone’s Facebook advertising campaign, getting ready to scale for a more significant impact on the company’s sales numbers.